CPTSD associated with Developmental Trauma can have broad systemic impacts on long term health. Chronic exposure to stress keeps the mind and body on high alert. Subsequent traumas result in compounded psychological injury and increase the degenerative biological effects of chronic triggering of the fear response system. I didn’t make the connection between my failing physical health and my mental illness for quite some time. I considered most of the relatively mild, infrequent symptoms I experienced to simply be a part of aging. Looking at the studies, results suggest that the cumulative effects following multiple traumas may lead to chronic illness. Blood sugar regulation problems, failing eyesight, digestive issues, tremors or trembling, chronic or heavy self-medication, and addiction are other health issues that are often seen in those who also have Complex PTSD. At the point that I ran out of questions about my childhood, once I had worked through all of my trauma inventory, I found that I was still experiencing symptoms. CPTSD was still having an effect on my life and I was still replaying the worst criticisms of myself in my head. I had looked at each situation, evaluated it, worked on it, come to a point of understanding and acceptance… but I was still doing the same things to myself that I had done through my entire life. I called myself names, I sabotaged my own life, and I fell into spells of wallowing in self-hatred and despair. I had to rebuild, but that part seemed to come last and cost the most energy. I found I was having some fairly unsettling issues and was quite worried about what was happening to me. My heart rate was often way too fast. That familiar feeling of butterflies in my stomach that had always been the signal of a looming panic attack was constant… even when I had experienced no triggers or had any real stress in my life. I felt like I was in a state of constant anxiety, but had absolutely no reason (that I was aware of) to feel the way I did. I was also fighting issues with low blood sugar alternating with pre-diabetic blood glucose levels. I finally confirmed endocrine system issues. I thought I was having some kind of subconscious trigger response, that maybe there was something that was setting me off that I couldn’t identify. Finding that long term stress causes these issues was a relief. It’s helpful to know that the symptoms I typically associate with solely mental processes have a solely physical source at times. I don’t have to go looking for more CPTSD problems to solve. 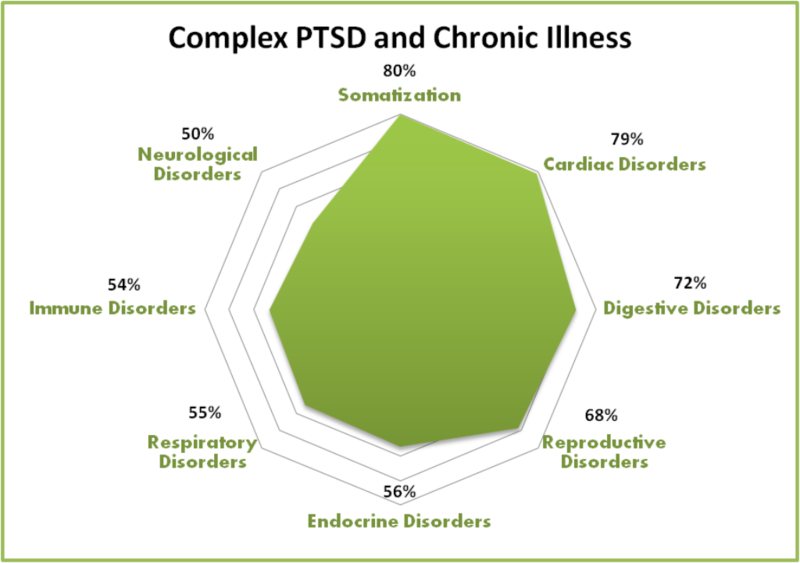 I gathered information from several studies to help me compile statistics on the correlation between Complex PTSD and chronic illness. There is also growing evidence that conditions like depression and suicidality can be detected in medical tests… further demonstrating the physical aspects of mental illness.